A short-term uptrend started Oct. 31, and we finally started to get confirmation from the PMO index on Nov-3 with an attractive looking tick higher. What indicators gave away the new short-term uptrend on Oct. 31? The Bullish Percents did their part. This is a nice little turn around in trend. 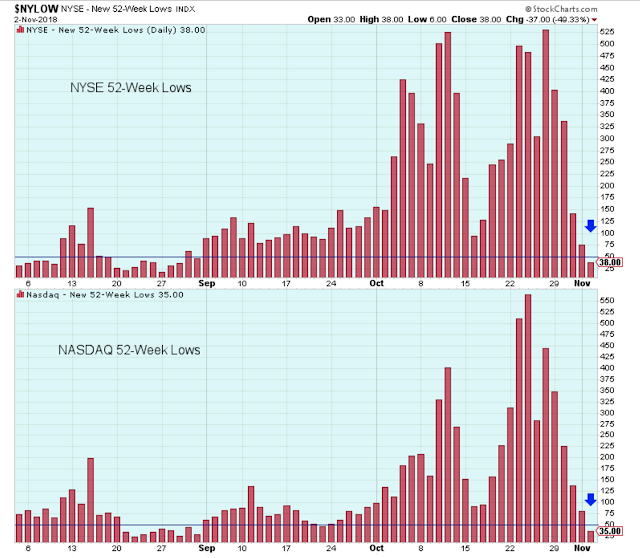 The number of new 52-week lows has dropped back down to a level where stock prices do a better job of moving higher, and where it is a bit safer for us to try to take advantage of the uptrend. But watch this chart everyday. 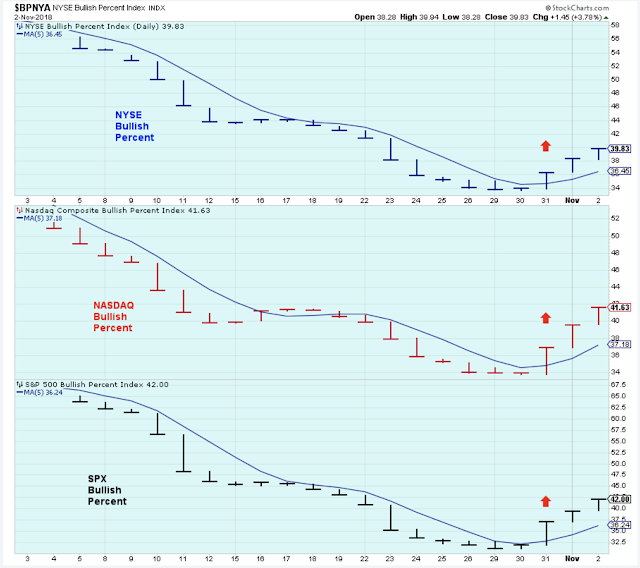 In this shaky market environment, new lows could start to increase again and that would ruin things short-term. I haven't made any short-term purchases. I am not sure if I will. I'm calling it. My long-term accounts are going defensive. I'm building a moat, and doing what I can to protect what I have. 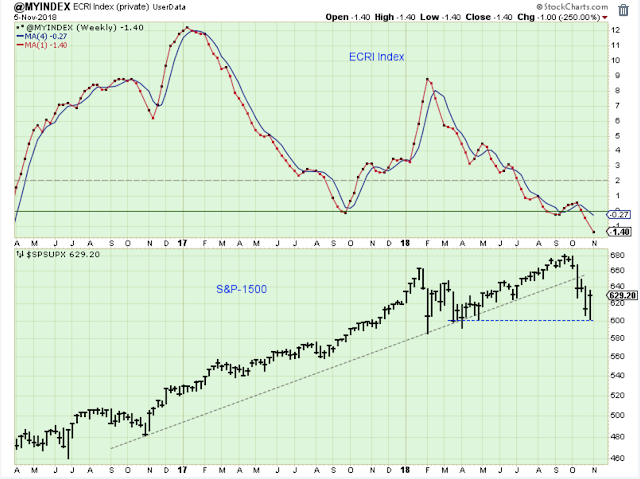 The ECRI is now decisively below the zero-level where economic trouble and lower stock prices tend to occur. Of course, the ECRI index could whipsaw and start to move higher at any time, so you have to continue to pay attention to it. For me, defensive means selling stocks into strength, and not making any new purchases. I am not sure if I will sell all holdings, but a large percentage will be sold. Also, I am not sure if I will buy any inverse funds to make money as the market goes lower. We'll see. How fortunate we are to have this index available and published for free. Is it playing with fire to hang onto stocks that are headed lower just to get a better price on a counter-trend rally? Should I sell the weaker stocks first, or should I also sell strong stocks to lock in profits, and not worry about the potential for a rally? Knowing me, I will do a little bit of both for awhile. And then one day, I'll just start selling aggressively. 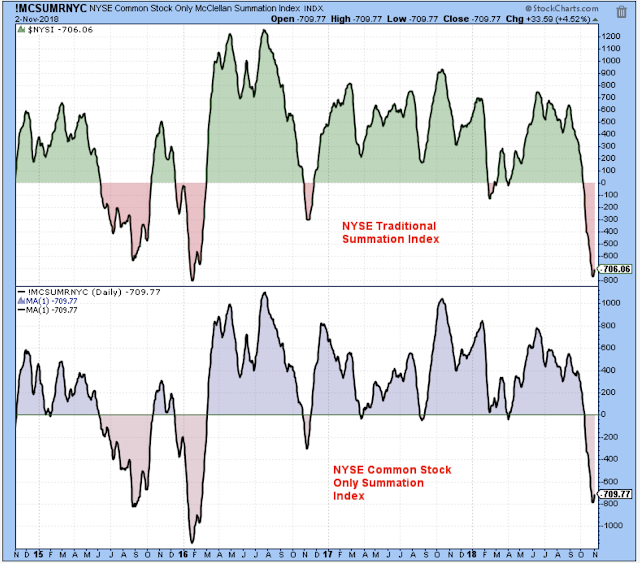 These Summation Indexes are down to levels where the market has started to bounce off its lows. Is this drop in oil prices good or bad for stock prices? It's bad for oil and commodity stocks, of course. But a lower oil price means there is less pressure for higher rates which is good for Technology stocks and bad for rate-sensitive Financials. At the moment, however, I think most market watchers feel that lower oil reflects weakening global demand which therefore means a softening global economy, and that can't be good for stock prices. IMHO, a break below this support would be another tick in favor of moving out of stocks and into cash, but if oil prices hold here, then it might not be so bad for stock prices overall.